I thought there may be people who wished web browser can translate the web pages written in foreign languages. So, I created a bookmarklet that displays the translated text on the same page. It works on iPad and other web browses on PC (*). In essence, the installation completes just by bookmarking the link below. If you use the web browsers such as Chrome or Safari, you drag and drop the link using left mouse button. If you are using Internet Explorer, right click on the link and "Add to Favorites...". 3. Edit the bookmark you created at Step 1 by replacing the link with the text you copied in Step 2. In other words, your original book mark contained the link as "http://daigotanaka.org/?p=912". Erase this, and paste the text you copied at Step 2. 4. If you are doing this with iPad, the bookmark needs to be appearing in Bookmark bar as in the image above. That is all for the installation. Highlight the foreign text, and choose the bookmark. A small frame will open in the same page at the top right corner. You can make the frame bigger or smaller by clicking on the magnifier icon. Click X to close the frame. If you highlight other text and choose the bookmark without closing the frame, the translated text will be updated with the new one.The quality is just machine-translation level after all, but it can auto-detect the language and translate for you. I've sometimes seen the translation frame's design breaks on iPad. 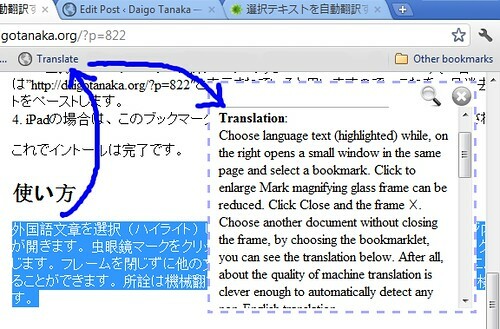 Try clicking the magnifier icon to make the frame bigger, it often makes it easier to read the translation. Please check manuals of the operation systems and web browsers for the details on how to add bookmark. By default, it translates text into English. You can choose the target language by choosing from the pull-down menu. It does not handle certain languages very well especially two-byte Asian languages on Safari.